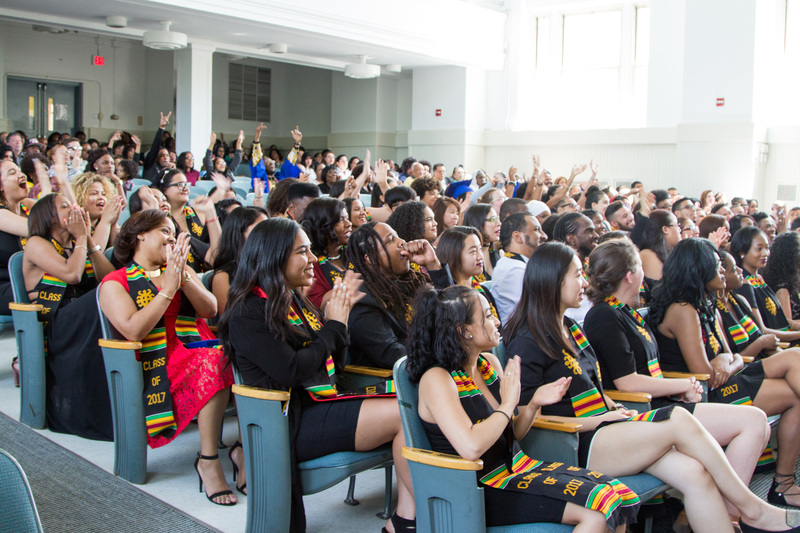 One of the most vital traditions on the SUNY New Paltz campus continued during the 2017 Commencement weekend, as more than 100 SUNY New Paltz students of color stood before a standing-room-only audience of family, friends and faculty members and were inducted into the First World New Paltz alumni society, on May 20. First World Graduation is a distinctive rite on the end-of-year calendar at New Paltz. It emphasizes the deep historical roots that inform campus culture and intellectual life, while keeping the focus on the exemplary achievements of present day students and graduates. “We are our ancestors’ wildest dreams,” said Student Association President Yaranny Reynoso ’17 (Black Studies, Psychology). “We are the generation that has the power to change the world, a world that is becoming more open to change. We are about to enter the workforce and make it diverse – but there is unity in our diversity. 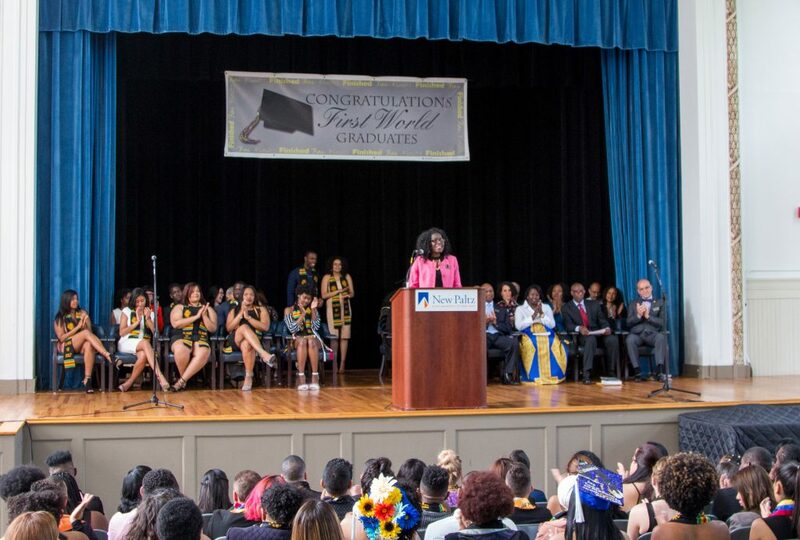 As is tradition at First World Graduation, the program opened with the singing of the Black National Anthem, performed this year by Brianna Knight ’19 (Early Childhood & Childhood Education). Representatives of the College administration and faculty then took to the stage to offer words of reflection, guidance, and congratulations. First World New Paltz’s history is intertwined with that of the College. Its roots can be traced to the diversity movement that began on campus in the 1960s and led to the creation of vital institutions such as Educational Opportunity Program (EOP) and the Scholars Mentorship Program (SMP). EOP first held its own graduation ceremony in 1973, and that annual event was later expanded and renamed to include general admission students. Today First World New Paltz stands not only as a unique Commencement-weekend event but as an association of College alumni of color, whose activities include the maintenance of a robust professional network and the organization of a First World Reunion on campus every five years.